You are Jasmine, a young acrobat and street entertainer--and sometimes a thief, as hard times has fallen on you, your father and the city of Najpoor. The name Karnak is spoken in whispers. Dark magic is rumored. Then you are caught stealing and your very life depends on your ability to find the magical Aphrodite's Mirror. Many want it, none have been able to find it! Will it cost you your life and soul? 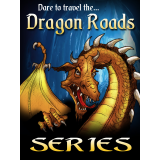 Dare to take the dragon roads for treasure, adventure, magic and possibly even first love. "This book is completely delightful. I couldn't help but lose myself in this magical fantasy. This is my first interactive book and I can honestly say I am HOOKED. "Aphrodite's Mirror" shows how information becomes experience. The book examines how surprising personal experiences are created where virtual realms meet the real world and where dataflow confronts the human senses. I was transformed into Aphrodite herself as I read and played my way through this extraordinary adventure!"